In order to meet consumer demands, FlagandBanner.com has expanded their clothing and jewelry product lines to include name brand fashions and on trend ready-to-wear patriotic clothing for the upcoming summer season. Made in the USA, this fashionable True Hitt sweater is available in soft red, white and blue or trendy black and white. Arkansas' FlagandBanner.com has been in the flag industry for more than 40 years. Their experience has shown American's not only love Old Glory in front of their homes and businesses but also in their ready-to-wear clothes. Patriotic fashions are always in style but demand increases when patriotism spikes. This year provides two events that are sure to illicit American pride: elections and Olympics. The patriotic season kicks off with Armed Forces Day, Peace Officers Memorial Day and Memorial Day all falling within the month of May. Flag Day is in June, Independence Day on the fourth of July, US Coast Guard Day and National Airborne Day are celebrated in August and Labor Day, VJ Day, Patriot Day, Star Spangled Banner Day, Constitution Day, US Air Force Day and National POW/MIA Day wind up the season in September. Add to that the Summer Olympics and the Presidential election, one can understand this will be a year that people will be proudly sporting patriotic fashion. In order to meet consumer demands, FlagandBanner.com has expanded their clothing and jewelry product lines to include the name brands of True Hitt, Silver Moon Factory, T-Party, D.K. Fashion, Socksmith, Yak & Yeti, Eagle Wing, Lord Daniel sportswear, and Montana West. Products include a shoes, socks, sunglasses, jewelry, dresses, swimwear, watches, ties, scarves, men and women shirts, pants and a children’s line. 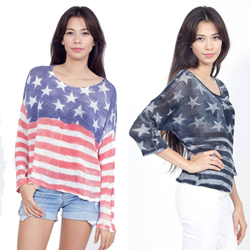 Those keeping up with trending fashion know stars and stripes have gone Black and White. Celebrity watchers will have seen the monochromatic patriotic clothes and caps worn by Beyonce, Carrie Underwood, Kate Upton and others. With a degree in fashion merchandising, Kerry McCoy, owner and president of Arkansas' FlagandBanner.com has always had a flair for fashion. "I am excited about expanding our clothing line. I especially love the black and white clothes. Being a small business owner I have the flexibility to try new things. I have to really hold myself back from being too far out on trends and technology. It is not called the bleeding edge for nothing. You can really lose your shirt by advancing your company too fast. There is a balance between new ideas and expenditures with trying to ensure our customers have a large selection, pleasant experience and ease of check out. We are always improving to provide the most quality product, expert service, and outrageous support possible," said McCoy. In business since 1975, Arkansas' FlagandBanner.com carries more than 20,000 products including flags, flagpoles, installation, hardware, accessories, garden banners, bunting, clothing, home decor and more on their website. Visit their historic showroom located at 800 W. 9th Street in downtown Little Rock, Arkansas. Open Mon-Fri 8-5:30 and Sat. 10-4, closed Sundays. The company also manufactures custom flags, banners, bag signs, construction banners, barricade signs, event tents, trade show table cloths and other custom products. For more information about FlagandBanner.com visit them online or call 1-800-445-0653 to speak with one of their friendly flag experts.